Cleaving 1-cell L. pictus zygote, double labeled for DNA (light blue) and microtubules (red). Image courtesy of Jon Holy, Univ. of Minnesota-Duluth. Cleaving cells use the same polymer systems to perform mitosis and cytokinesis as dividing somatic cells, as the spectacular micrographs on this page show. In the micrograph shown above, microtubules have been immunostained, and DNA has been stained using a dye. 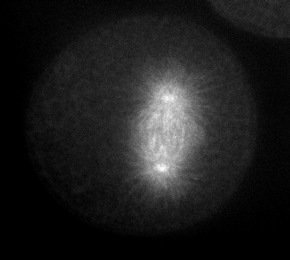 In the images below, the complexity of this microtubule array can be seen clearly in anaphase and telophase of first cleavage. Cleaving 1-cell S. purpuratus zygotes, immunostained for microtubules. 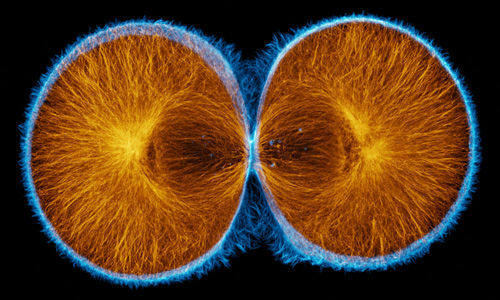 Astral microtubules radiate away from the spindle poles towards the cortex.Top: anaphase. Bottom: telophase (projection of a 3d reconstruction). Images courtesy of George von Dassow, Center for Cell Dynamics, Univ. of Washington. Click on the thumbails to see three movies that show the structure of microtubules during mitosis. The first two are immunostained S. purpuratus zygotes corresponding to the still images above (courtesy of George von Dassow, Center for Cell Dynamics , Univ, of Washington). 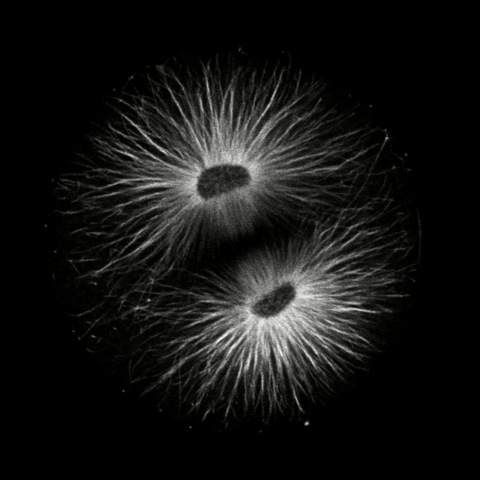 The third shows microtubule dynamics in a living L. pictus embryo imaged using fluorescent tubulin (courtesy of Jan Ellenberg, EMBL, Heidelberg). 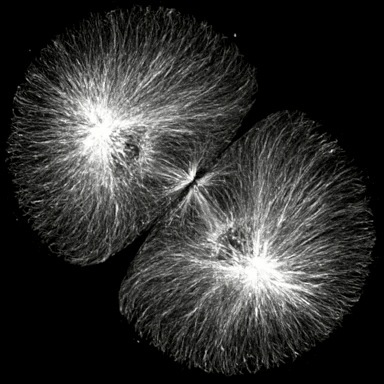 Microtubules are dynamically assembled in the mitotic spindle; their rapidly growing/shrinking ends (the "plus" ends) radiate away from the paired centrosomes at the spindle poles during metaphase and anaphase. The plus ends of microtubules can be tracked using EB1, an example of a class of proteins that associates with the plus ends of microtubules. 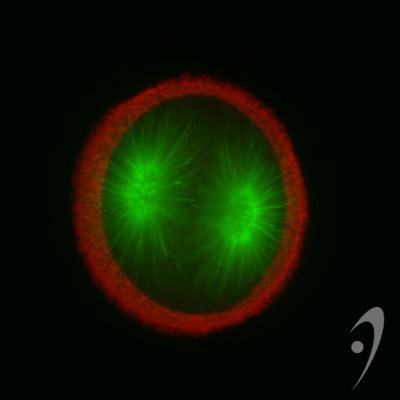 Click on the thumbnail below to see a S. purpuratus zygote expressing EB1::gfp, courtesy of George von Dassow, Center for Cell Dynamics, Univ. of Washington. 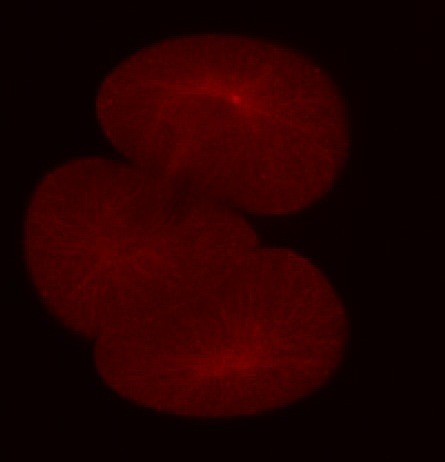 One of constraints on imaging echinoderm early embryos is that they are round. As a result, refraction of the light passing through their interiors makes imaging deep into such embryos difficult. One way to circumvent this problem is by using confocal microscopy. In a confocal microscope, out-of-focus light is excluded from the final image, producing a mucch crisper, less blurry image. In the image below, the same sea urchin embryo has been imaged using wide-field microscopy on the right, and confocal microscopy onthe left. It is easy to see the difference confocal micropscopy makes. In addition to the microtubules of the mitotic spindle, cleaving cells also possess non-spindle microtubules know as astral microtubules, which radiate away from the centrosomes of dividing cells. The astral microtubules come very near the surface of the cell, and may stimulate the formatino of the contractile ring during cytokinesis. 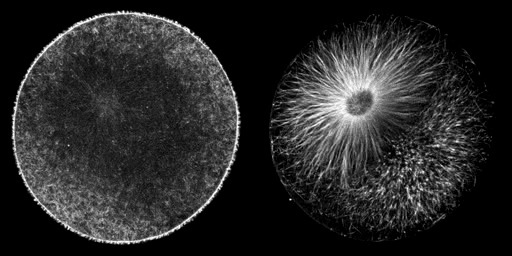 The beautiful confocal movies below show these microtubules and the actin in the cortex of the embryo, in S. purpuratus and S. drobachiensis. Click on the movies to see a 3d reconstruction of astral microtubules in a S. purpuratus zygote (left), a "fly-through" of a one-cell zygote during anaphase immunostained for microtubules (center) and a reconstruction of a section through an embryo simulataneously stained for actin (red) and microtubules (green; right). 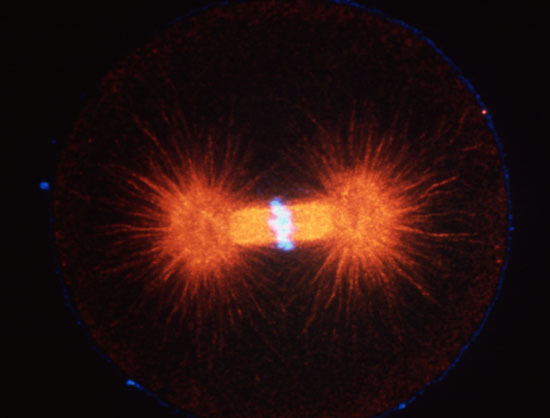 False-color merge showing F-actin in blue and microtubules in orange at the very end of first cleavage in S. drobachiensis. This image is a projection of 25 consecutive 0.5 micron confocal sections. Courtesy of George von Dassow, Center for Cell Dynamics, Univ. of Washington.